If they were watching, and I was sure they were, they’d have to admit I did my best to iron out the smeared wrinkles. Fight as I may, the hard edge of a stained hand was no match for a day-old newspaper. The entirety of my arms shook in small bursts of exhaustion and admission. The picture showed me ducking the flash powder, my fedora and a locked briefcase covering most of my face. She was in the corner of the image, the ruffles in her dress enough to make the paper jealous. It was her last picture and I was sure they’d try to pin it on me. If only the stains were ink. The soda man, with a piping hot pot of black liquid in his hand, hesitated. His eyes darted from the paper to me. Perhaps he saw me tremble and figured he’d rather avoid catching a glimpse of my flask again. I was thankful he thought better of it. Maybe he saw the truth in my eyes. He filled me up and resisted the temptation to outwardly connect me with the picture on the front page. More likely, he saw through the folds of my jacket and knew that a man with a leather holster as his only friend had nothing to lose. A killer among us? Very dramatic. I never contemplated such a scenario given that painting, but the world you created is nothing short of mysterious and intriguing. Well done! Thank you!!! I love that painting, always have. 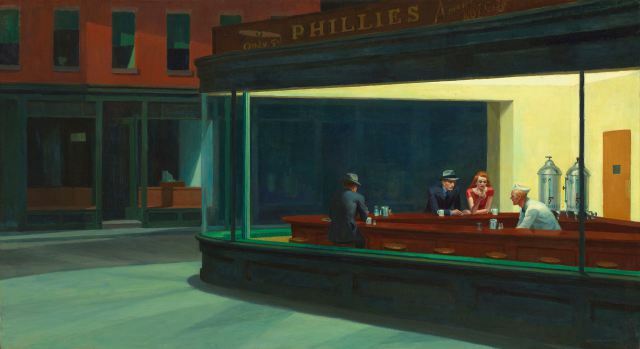 I also have an affinity for the greasy spoon and, lately, crime fiction – this entire Noir fiction genre is new to me, I’m trying to read a few of the classics. Perhaps my quick fictional post came from that interest…who knows! Really appreciate you taking the time to read and taking even more time to leave a kind comment. Thanks again and happy Halloween!